I really don’t know what I expected out of our visit to Macau, other than to eat a pork chop bun, see (but perhaps not gamble in) casinos, and be visiting a place I had always wanted to go that was also featured as a finals destination for America’s Next Top Model. I do know that I didn’t expect to find myself walking with my beautiful bride-to-be from Church to Church and sitting and pondering the meaning of life in each one, being thankful to be in a place that felt somewhat Western after spending two years in East Asia. 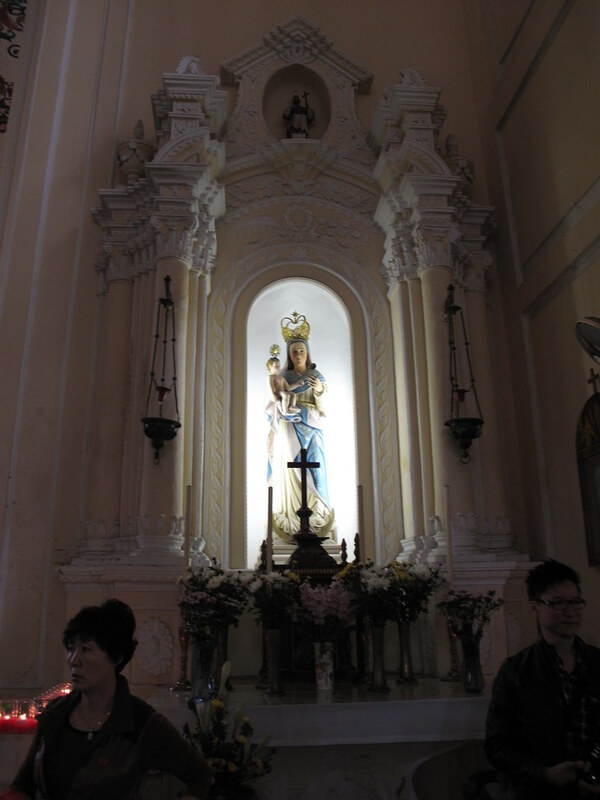 So we arrive in Macau by ferry from Hong Kong, get out of the bus that takes you downtown, walk across the plaza and into this church. St. Dominic’s. Hard to miss as it’s canary yellow. It seemed kinda old, but I just googled it to get its name and basic facts (I have photos from 5 years ago and basically no notes…) and would you believe it was founded in 1587? It’s going on 500 years old. So you walk into St. Dominic’s and it’s BRIGHT white. I imagine it’s kinda the shade of white that the Portuguese could find to make paint with when they arrived that most reminded them of churches at home. 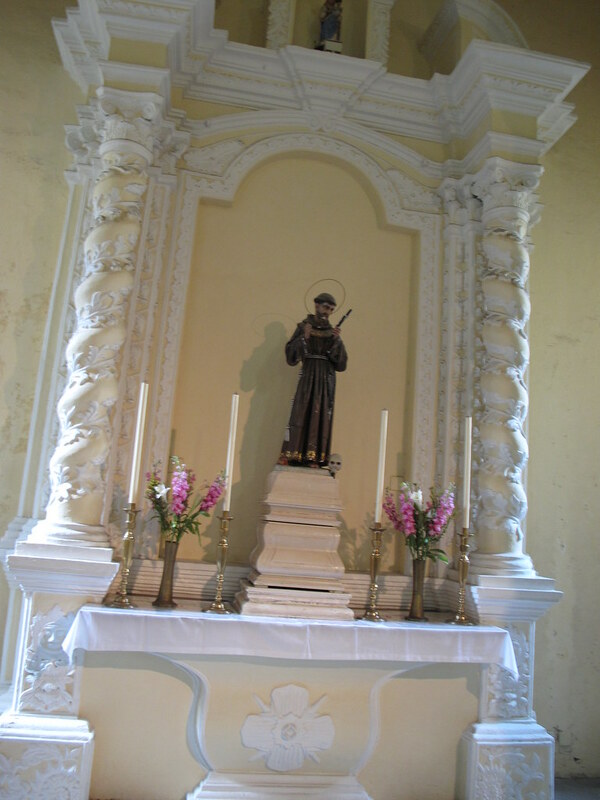 It reminded me a bit of the old Spanish missions here in South Texas that came with the Conquistadores around the same time period, however the imagery is just a little different. 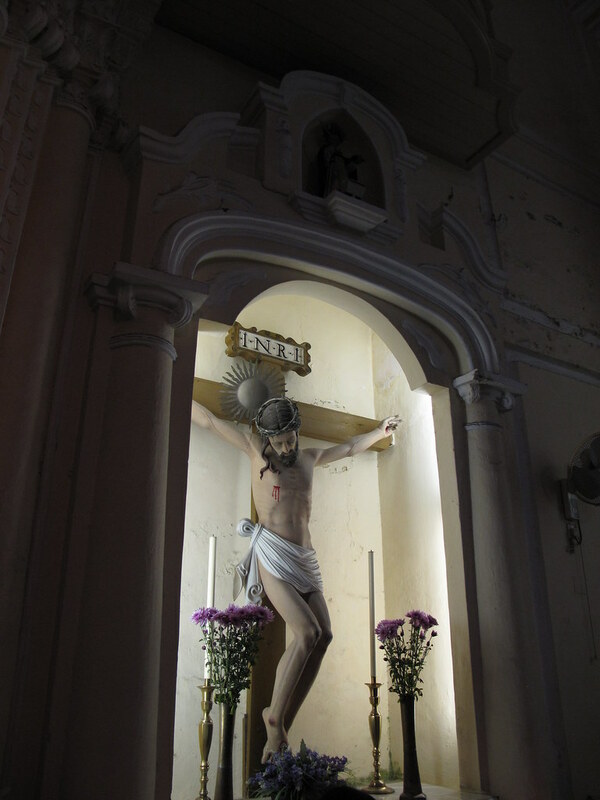 It’s like the images of Mary and Christ that you see as more realistic in the Spanish churches were a bit more stylized so as not to be “graven” images by the Portuguese. I don’t think that’s the real explanation, but there is a difference in style. 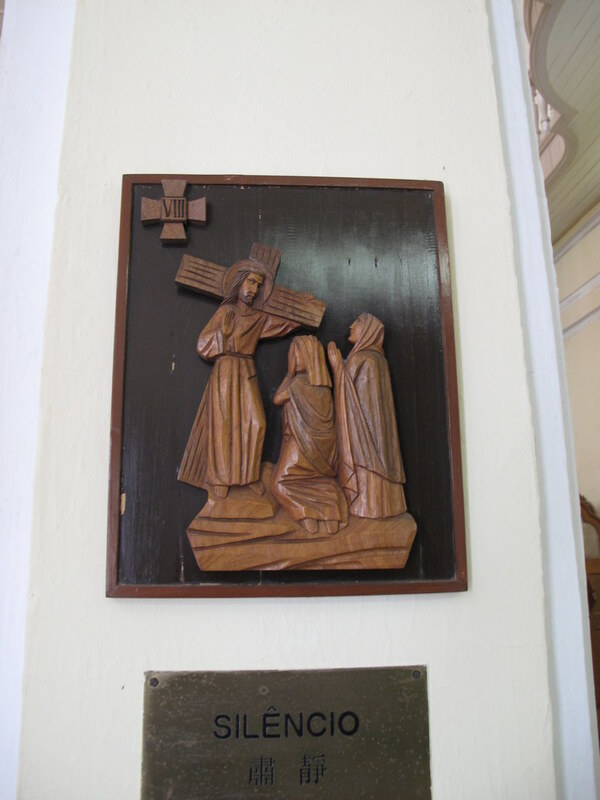 For example, this wood carving. 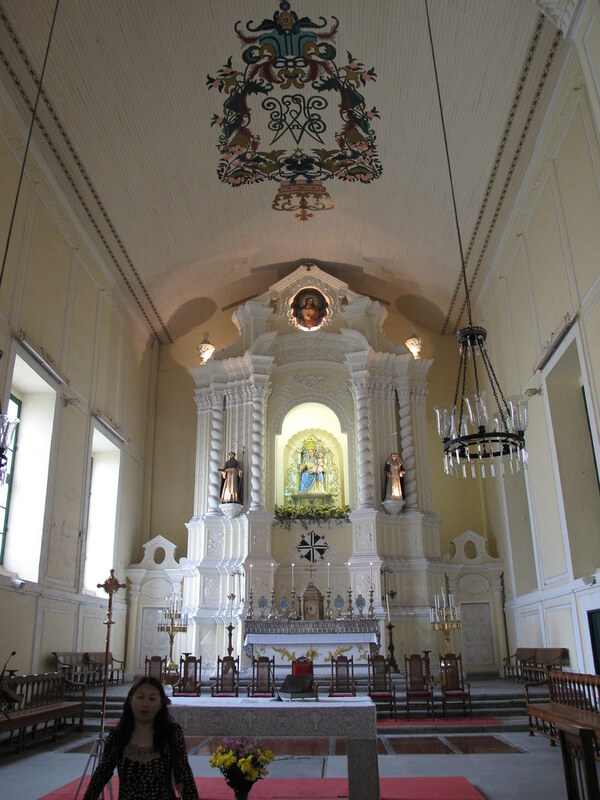 The whole church is wooden, I guess due to the lack of marble available on the island. I found the construction to be very straight, too. There’s lots of ornamentation on the surface, but it seems to be mostly appliqué. 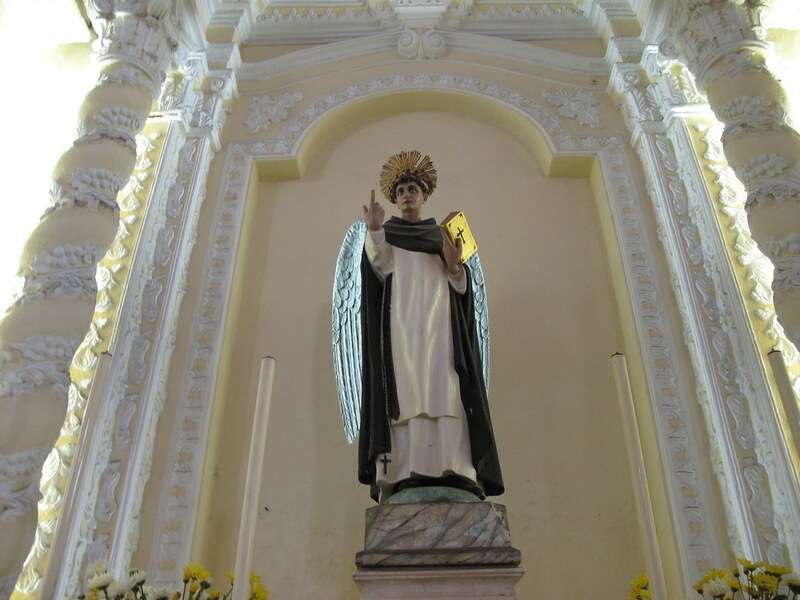 I’m not sure, but I’m guessing this is St. Dominic himself. I think the art style I’m referring to has to do with the high contrast of his facial features and low contrast of his robes. I just asked a Catholic friend if this was him. She thinks maybe. The one finger is a little weird, he’s missing his full iconography, but he’s in a dominican habit. Once again, I think the art style is kinda high contrast around the face, low contrast everywhere else. Putting the unimportant parts in a manmade bokeh. Once again guessing St. Dominic. 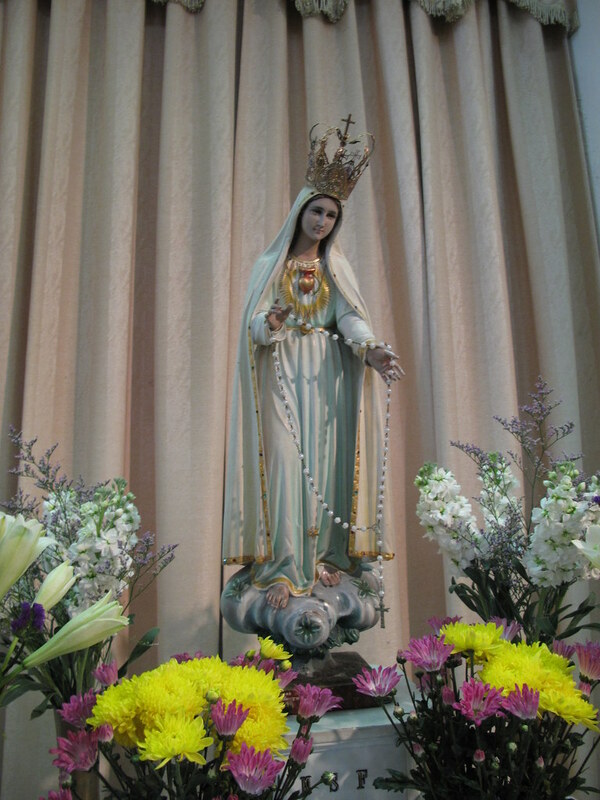 Immaculate Heart of Mary imagery, “looking Portuguese” according to my Catholic friend who is helping me with this post. Maybe Mary, Queen of Heaven. Heaven knows. Then back to the real world. 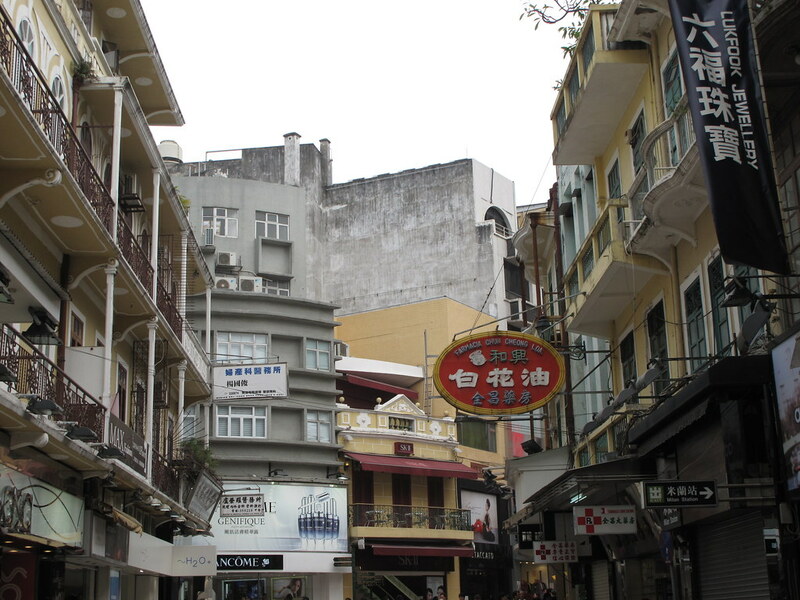 Macau was amazing because it was almost like being at home. I grew up around Spanish language, Spanish colonial churches, and the sort. 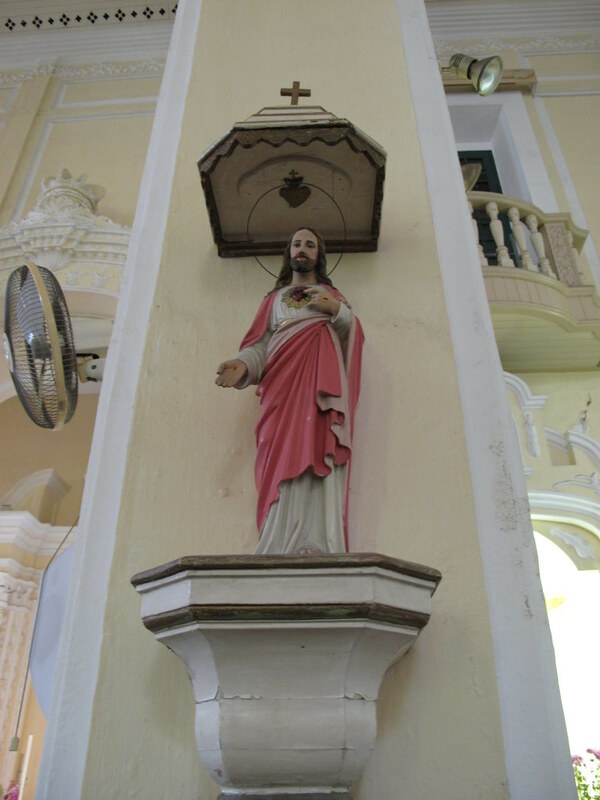 These Portuguese churches, the Portuguese language…it hit close to home. But then unmistakably you realize that you’re in a unique pocket of China, thousands of miles from the Western culture you grew up in. And you’re happy because not many people (even though millions upon millions) will ever go to such a unique place. 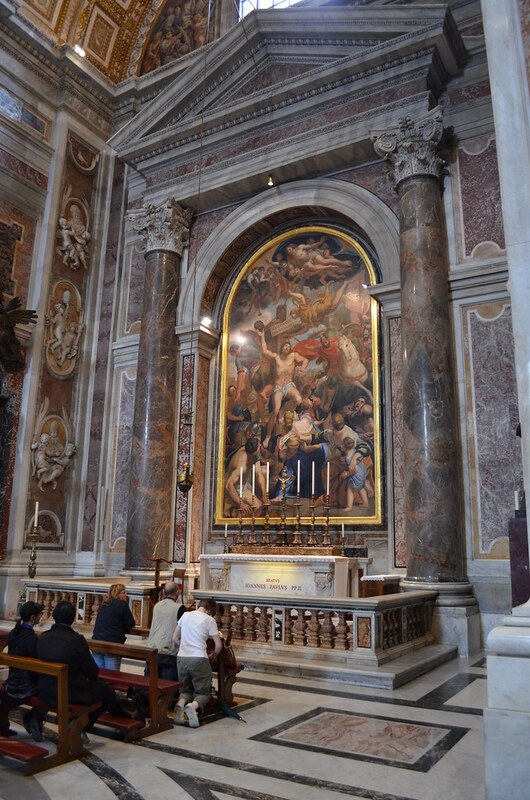 So there’s probably close to a billion historically significant works of art in St. Peter’s Basilica, mostly by Italian renaissance artists who later lent their names to a ragtag group of martial arts knowing turtles. The former (unqualified) art history professor in me wants to show you some of the highlights, but I don’t really know in most cases who made what, nor do I feel like looking it all up on wikipedia and pretending I knew all along. Unlike my previous posts, my comments about the art will appear above the photo. As if we’re on a tour and I’m speaking before you get a chance to look. 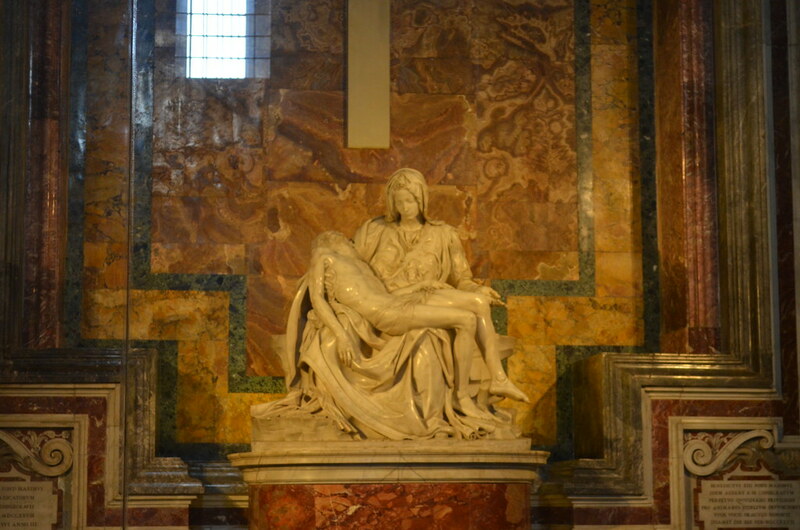 Here’s perhaps the most famous piece, Pieta by one Michaelangelo Buonarroti. One of the Apostles, who appears to have just hurled something at you. 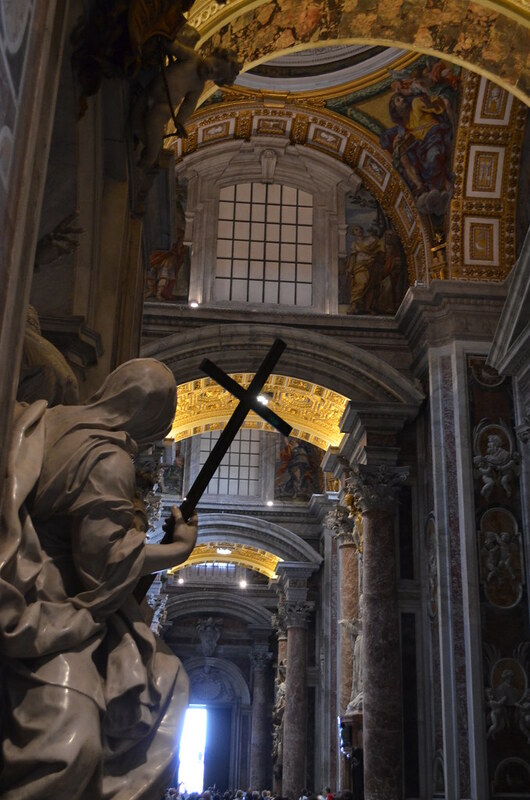 Followed by another Apostle, who perhaps caught what the first had hurled. 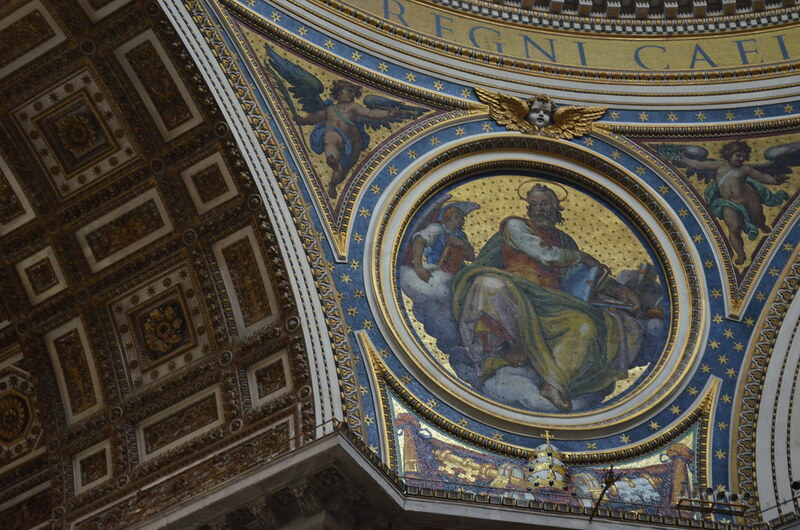 I guess I didn’t get a photo of the fourth apostle at the dome, so we will have to travel back to Rome one day. 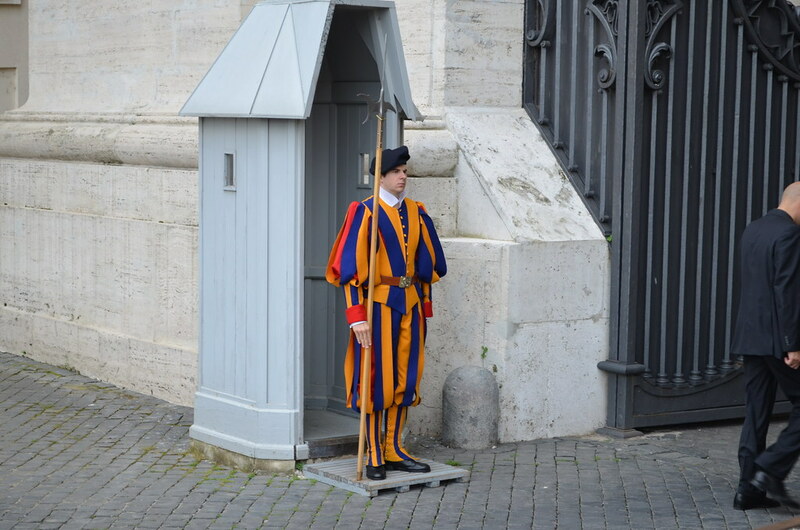 However, upon exiting St. Peter’s you run headlong into Swiss Guard with their Halberds. Their uniforms are artful AF, aren’t they? 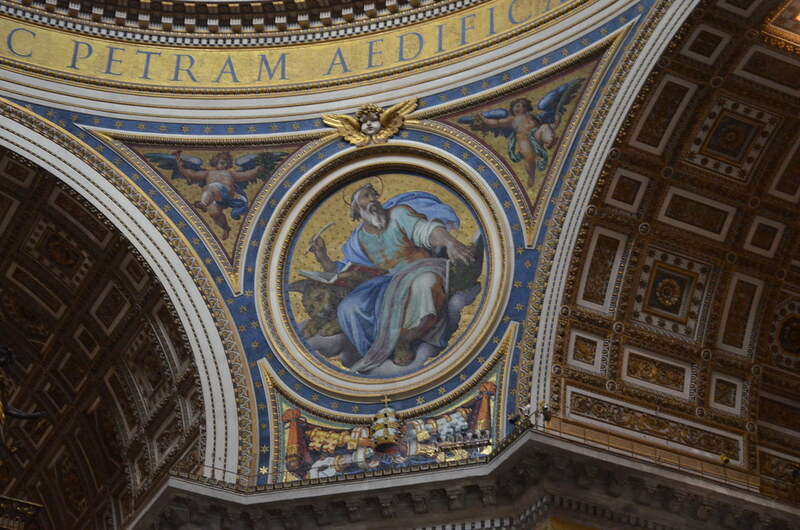 So this will conclude my 4 part series on St. Peter’s Basilica. I think that anyone regardless of faith would enjoy a walk around in this church. There’s literally so much to see. If you attend a mainline Christian church, you will appreciate it from a heritage viewpoint. If not, there are all sorts of curiosities to indulge your brain. Plus the scale is just overwhelming altogether. 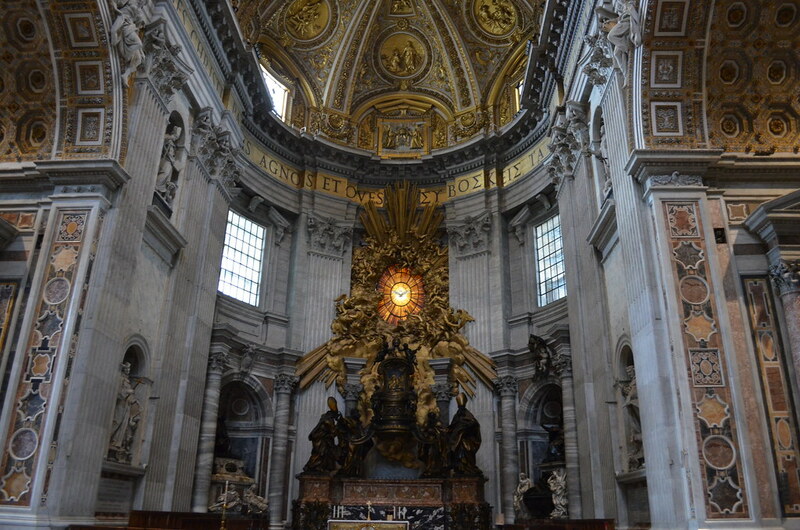 I’d say St. Peter’s Basilica is not to be missed. 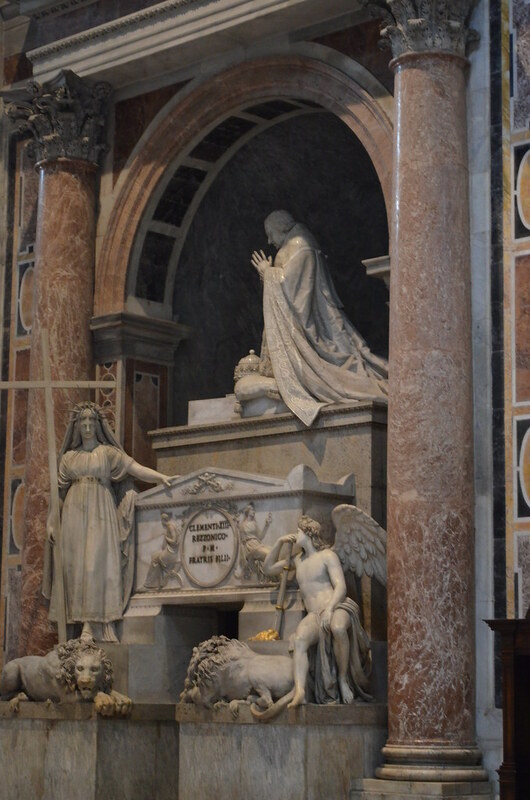 As I’ve mentioned in my posts about the Abbey of St. Victor in Marseille, Barcelona Cathedral, the Basilique de Notre Dame de la Garde, St. Cecilia, just up the river from St. Peter’s and other churches we have visited, one of the things that REALLY fascinates me about Catholic churches is the presence of holy relics. You know, pieces of cloth or bits of wood that touched someone significant from the bible or the sainthood. Or parts of a saint. Really like, patellas and elbows, hands and fingers, etc. Macabre reminders that the history of the church actually happened outside of the confines of a book. 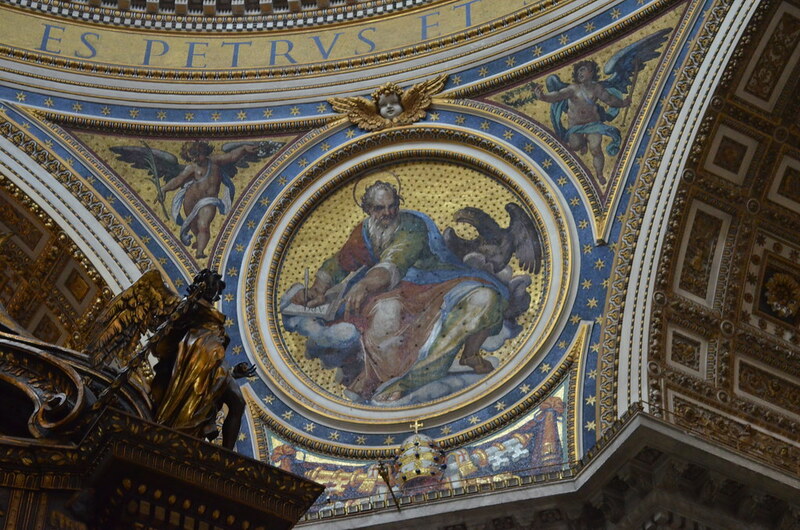 Well, St. Peter’s has some breathtaking relics. 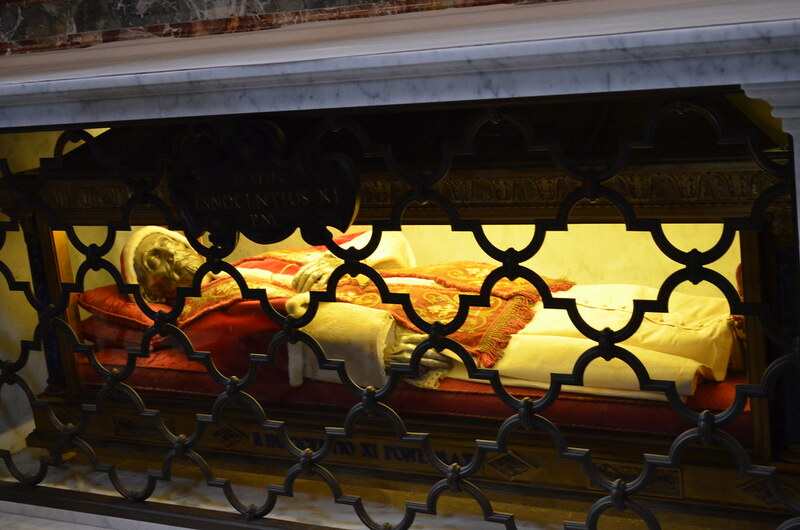 The ones that stood out to me the most were the relics of so many Popes from years ago. 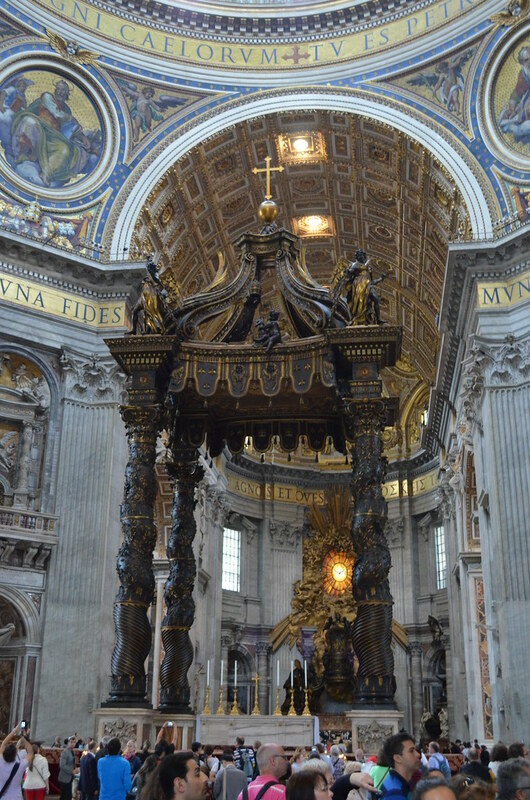 I think Pope Gregory is in that sarcophogus. 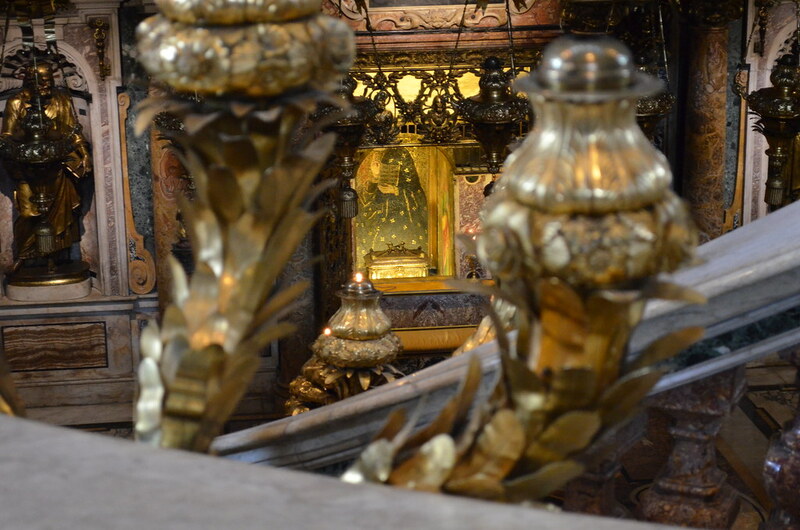 I’m not 100% sure, but I think St. Peter might be in this reliquary. Pope Alexander VI (maybe). Otherwise known as Rodrigo Borgia. He was the Pope in 1492 when Spain sent one Christopher Columbus to the new world. Pope Innocent XI. Cast in pewter it looks like. St. Pius X. There’s literally a catholic school a few miles from my house with the same name. But here he is! 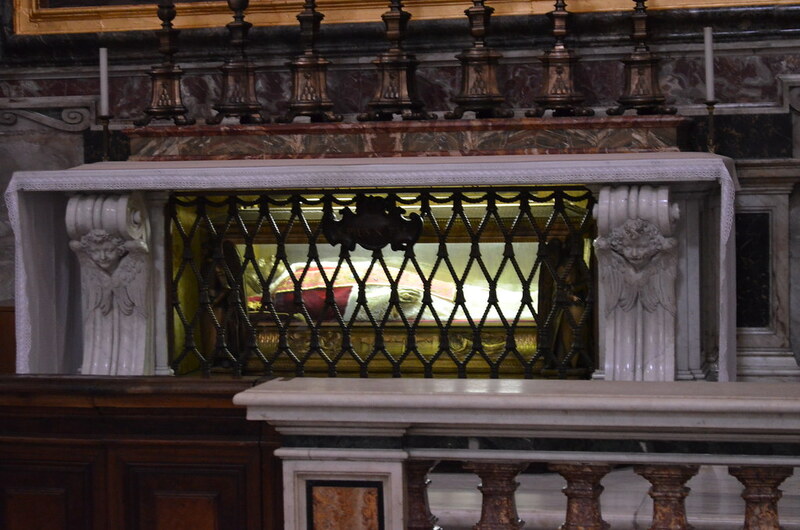 Perhaps the most attended of the papal relics that I observed was this one, and I’m pretty sure I know why. Pope John Paul II was the pope when I was born. He always seemed so kind, so pure of heart, and like he was actually interested in making the world a better place. I had no idea that I would ever get this close to him. 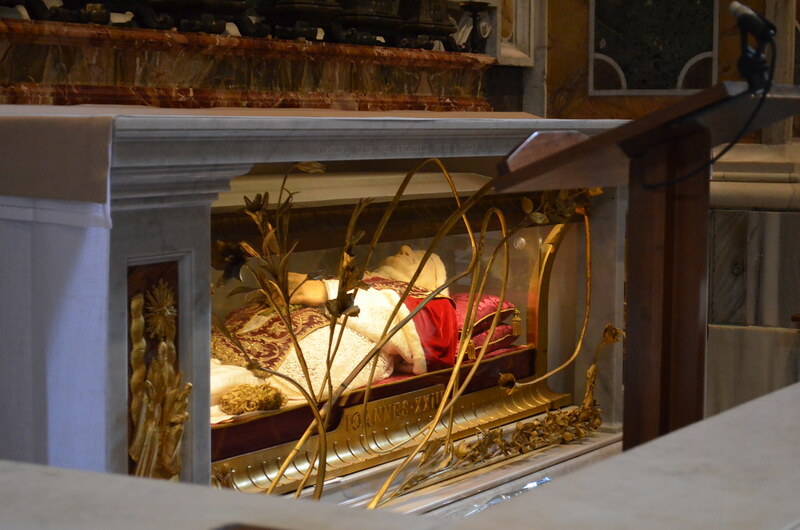 Of course, he’s a Saint now, so perhaps these people were asking for him to intercede for them. So it’s a bit macabre. That’s the only word I can think of to describe how I feel about holy relics like this. I think they do add something to the church. 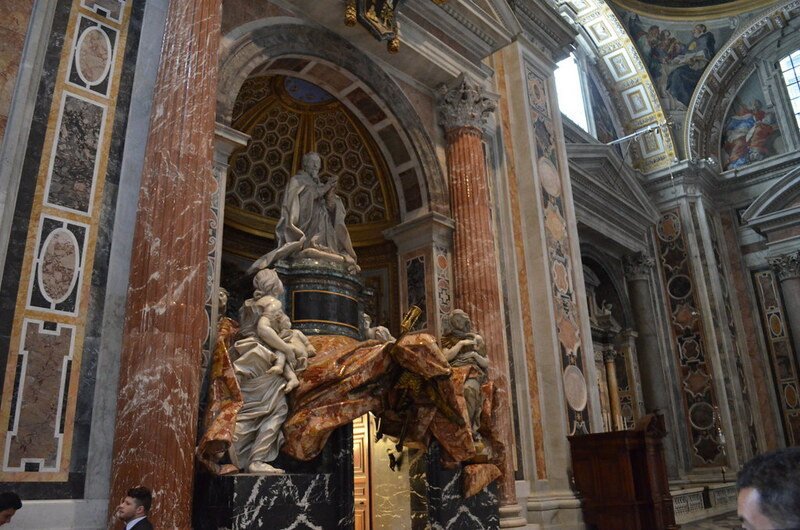 It took me a few minutes in St. Peter’s to realize that these were sarcophagi, not just altars. Once I realized that, I’ll admit I was a little freaked out to be standing in the midst of not just so many spiritual leaders, but world leaders from the time the Papal States were their own nation. 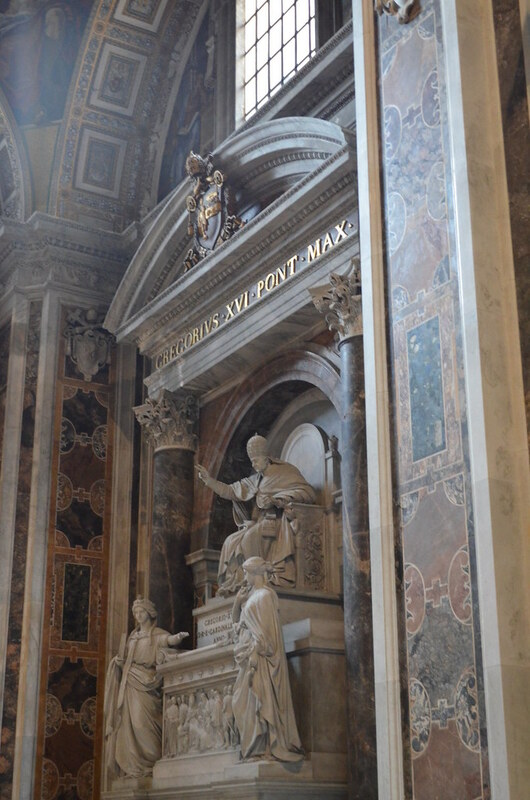 It’s absolutely nuts to think that all that separates you from someone as revered as a pope is a few inches of marble. 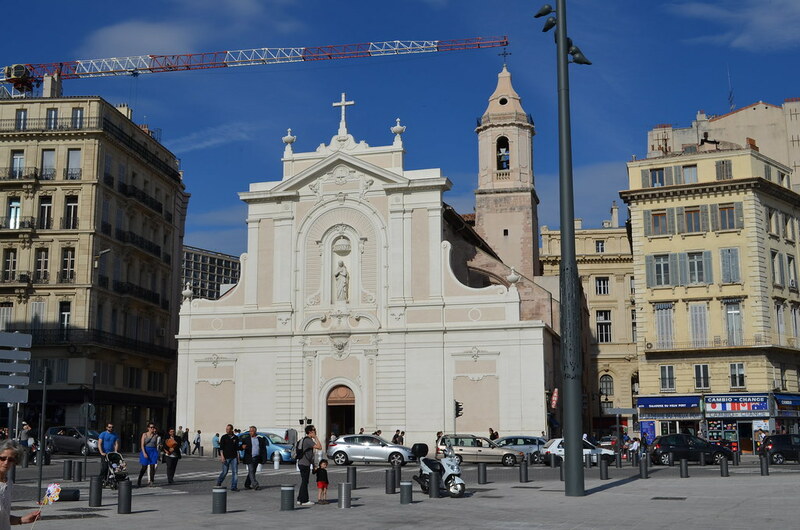 The Vieux Port of Marseille is a pretty stunning location with views of rows and rows of boats sitting in turquoise water, cafes and brasseries, the citadel and Abbey of St. Victor, and the shining beacon of Notre Dame de la Garde overlooking it all, and one building stands out amongst the rest. It’s the building that will blind you as it reflects the sun, will make you need to take HDR photos to avoid a hot spot with your camera, and may pique your curiosity, the church of Saint-Ferrol des Augustins. 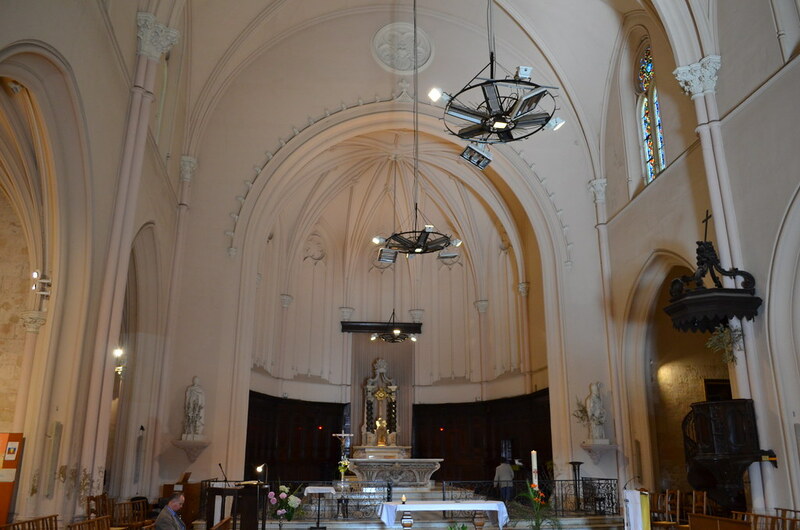 Unlike Notre Dame de la Garde and Marseille Cathedral, this is a parish church. Apparently the church has been here in one form or another, continuously built upon and expanded since it was owned by the knights Templar in the 12th century. 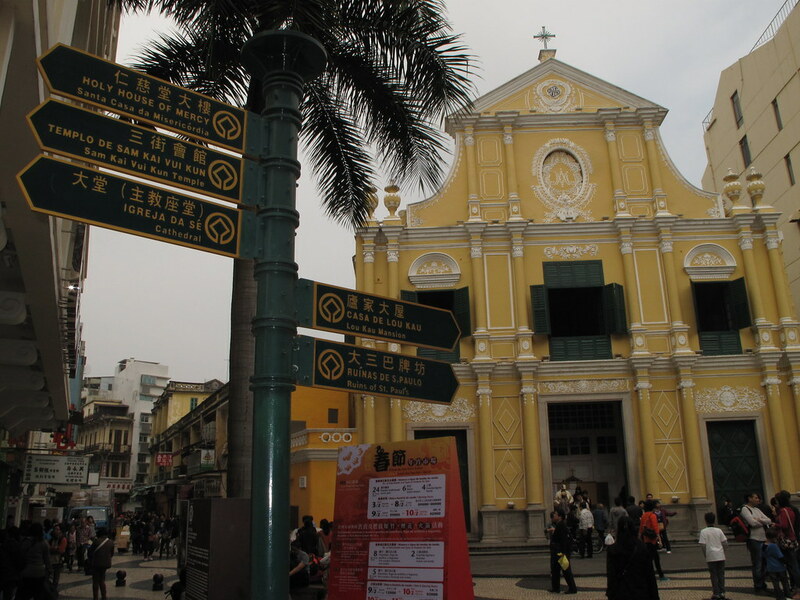 The Baroque facade and Italian style bell towers were built much later. 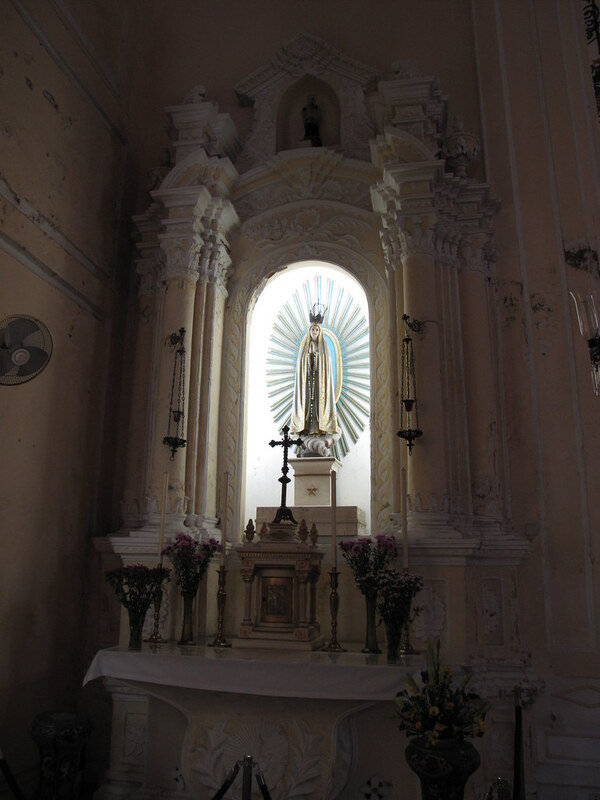 Smaller chapels dot the edges of the main sacred space, but there’s no super famous artwork or relics or famous dead folks to go visit it. It’s simply a nice and extremely old church that you should visit as you walk around the old port. 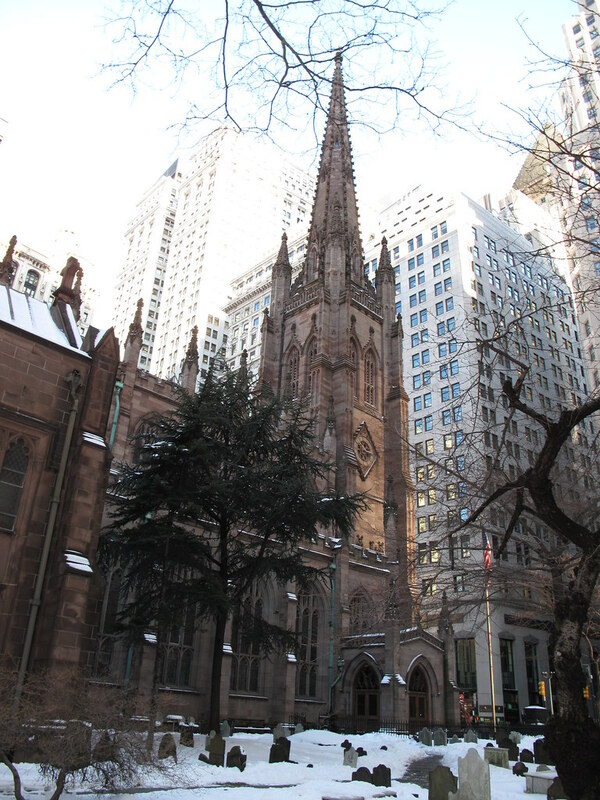 In lower Manhattan’s hustle and bustle lies a gem from the colonial days, and I would imagine is one of the oldest continually operating churches in the United States (not THE oldest, factcheckers!). 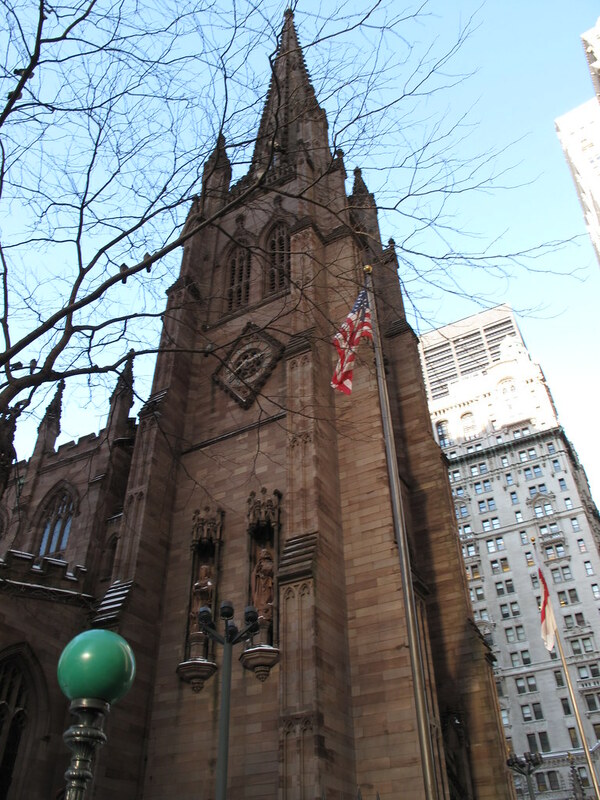 Trinity Church is an Episcopal Parish in the Diocese of New York, situated on Wall Street, featuring beautiful stained glass and the corpse (maybe just the gravestone now) of famed colonial rapper Alexander Hamilton. 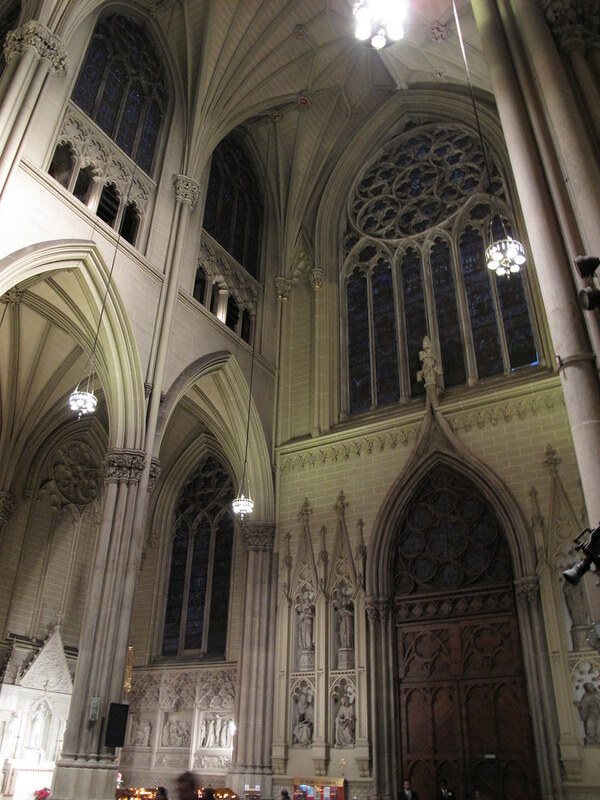 My visit to Trinity Church was, not unlike my visit to St. Patrick’s Cathedral, a welcome opportunity to warm up on a very cold day in New York. This was something like six years ago, so the details aren’t so fresh in my memory, but mommyPrimate and I met her sister for lunch in Lower Manhattan. I had some delectable swedish meatballs (of course I remember what I ate.) We stopped at a bakery (where I had the most wonderful pistachio macaron I can remember ever eating) then checked out Battery Park. We stopped into Trinity to warm up and see if we could find Mr. Hamilton. 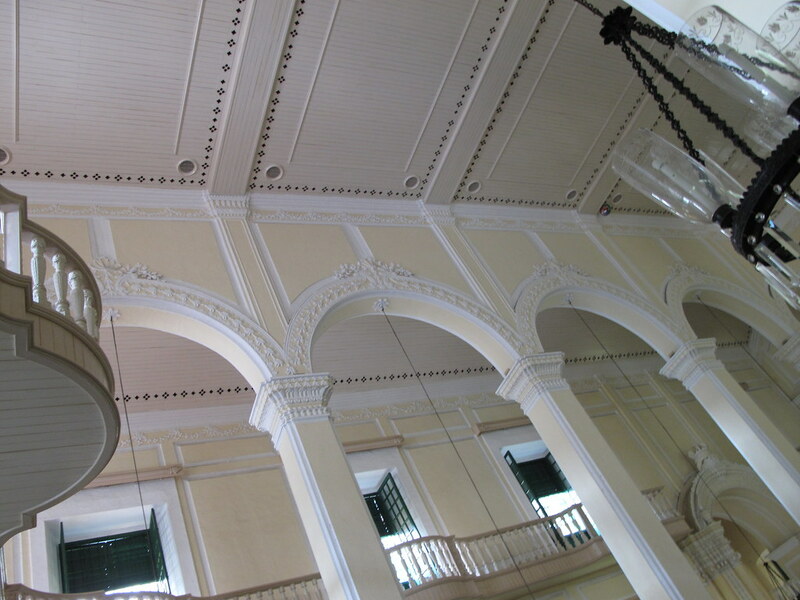 I do remember the simplicity of the architecture, and thinking that the exposed beams were beautiful. 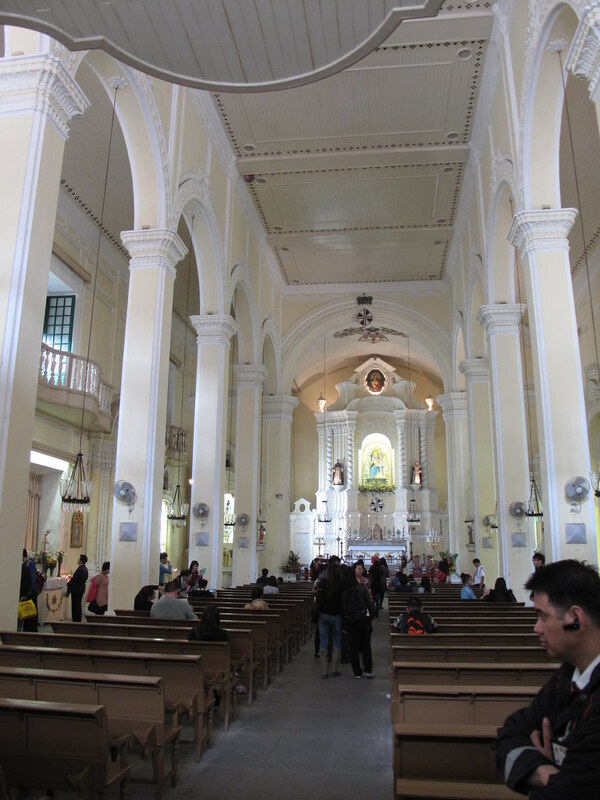 When we visited the Cathedral of St. John the Evangelist in Hong Kong, I remember thinking the construction was very similar. The stained glass was brilliant, and the darkness certainly gave everything a nice warm feel in contrast to the cold wind outside. Once we warmed up, we ventured into the graveyard. The snow was fairly deep, and I was amazed at the years on the gravestones. This part of the country was colonized at perhaps even a later time than the part where I currently reside, but by a different group of people, of course. I’m not so accustomed to seeing old gravestones in english, so it was a historical treat. 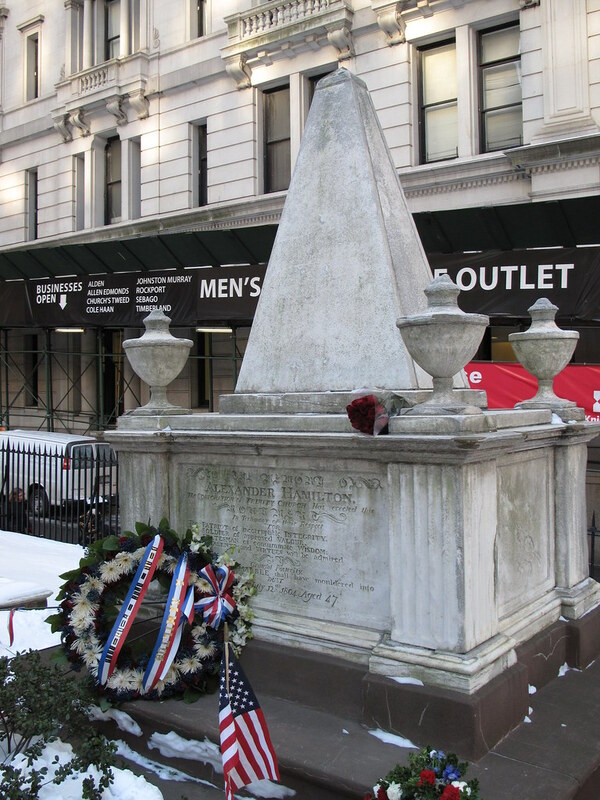 After a bit of a search, we finally found Mr. Hamilton, in the ground, where notorious rapper Aaron Burr put him many years ago. Yes. I realize they were actual important historical figures, and calling them rappers is just throwing some humor at my amusement over the popularity of the musical. I would really like to see it. My first visit to New York was cold, very cold. I was there with my then-girlfriend (now wife) visiting her sister before we moved to Korea for a couple of years, in the middle of the winter, and our visit was bookended with major snowstorms making the streets a slushy, soggy, mess. If I remember the order of events right, we spent the morning at the MoMA, then walked back through mid-Town in the cold on our way to Koreatown for dinner. 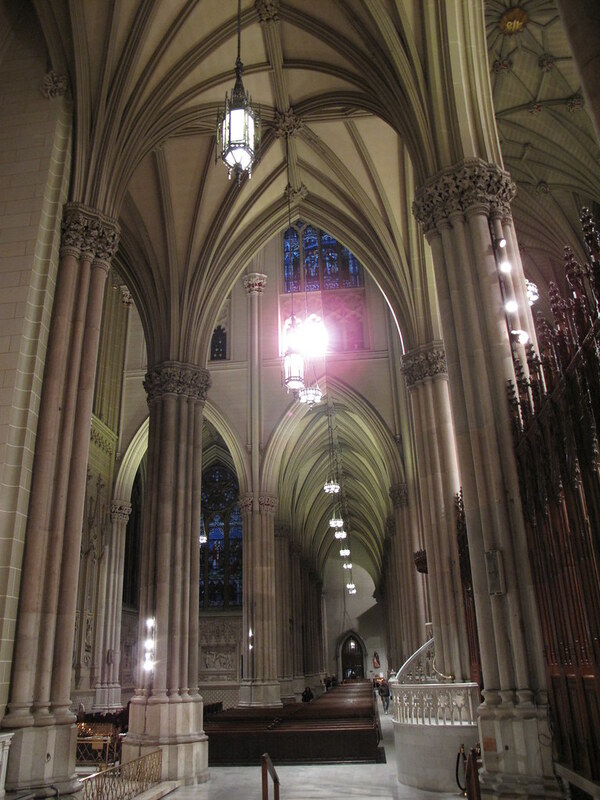 Frozen, tired, and in need of a respite, we ducked into St. Patrick’s Cathedral for a warm-up and sightseeing break. I was pretty certain at the time that this church was featured in Home Alone, maybe Home Alone 2, but in retrospect I think I was wrong about that. I remember that it was warm inside. There was a little music going, and it was very green. I guess that makes sense for St. Patrick. 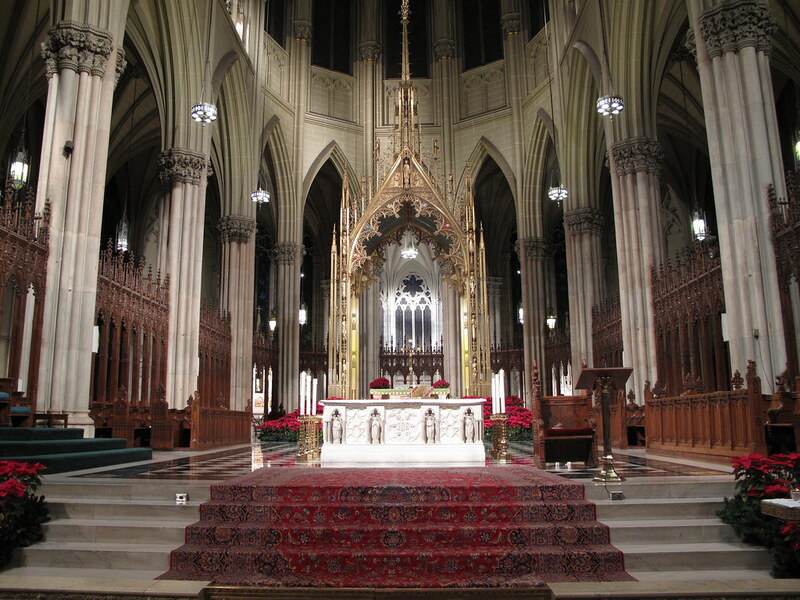 Anywho, I definitely remember it being beautiful and ornate, even more ornate than St. John’s, if a bit darker on the inside. 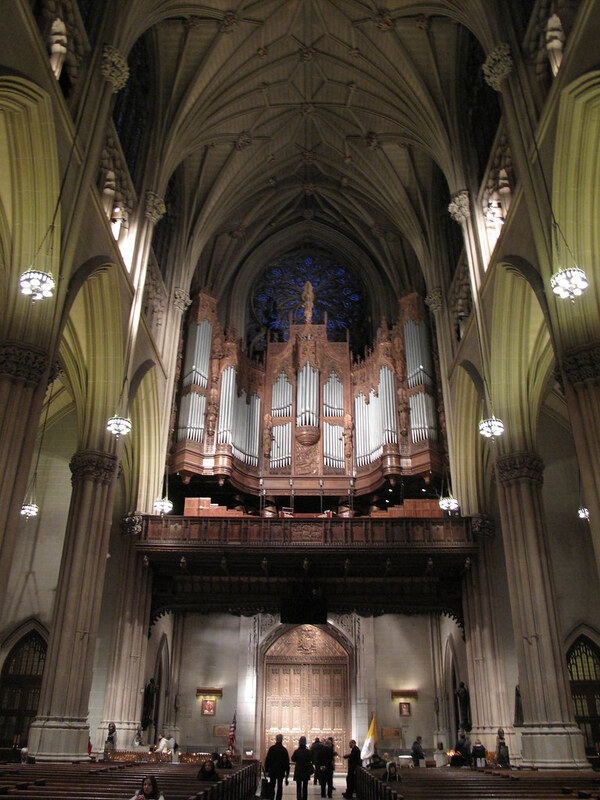 When we lived in New York I visited St. Patrick’s again briefly, but it was totes under renovation and I don’t think I even took any pictures because it was all scaffolding everywhere. I would certainly love to go back and check it out again the next time we’re in New York, though. I just realized, when I took all of these pictures it was after sunset, in the middle of the winter, no wonder the church seemed dark inside. The Chancel was spectacular, though. Something about the cloisters of cathedrals really piques my curiosity. I’d probably be disappointed to go on an exploratory expedition in one to find nothing but offices and broom closets, but I imagine there are all sorts of holy relics hidden in them. 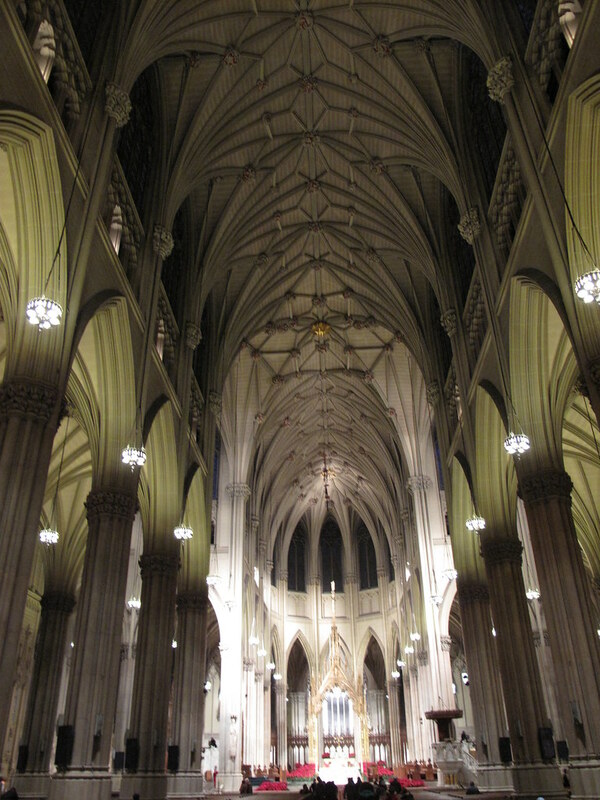 So yeah, St. Patrick’s is big and beautiful, right in midtown Manhattan ready for you to walk in and snap a photo or two. 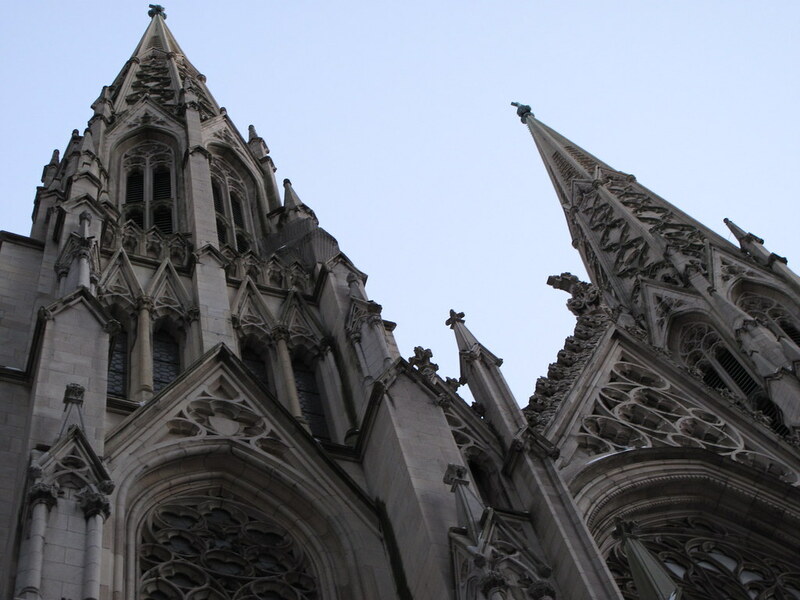 If you visit St. Patrick’s though out of church hopping interest and not just because it’s close to Rockefeller Center and on your tourist map, you must head up to 110th and Cathedral Parkway to see the Cathedral Church of St. John the Divine, too. It’s worth the trip. 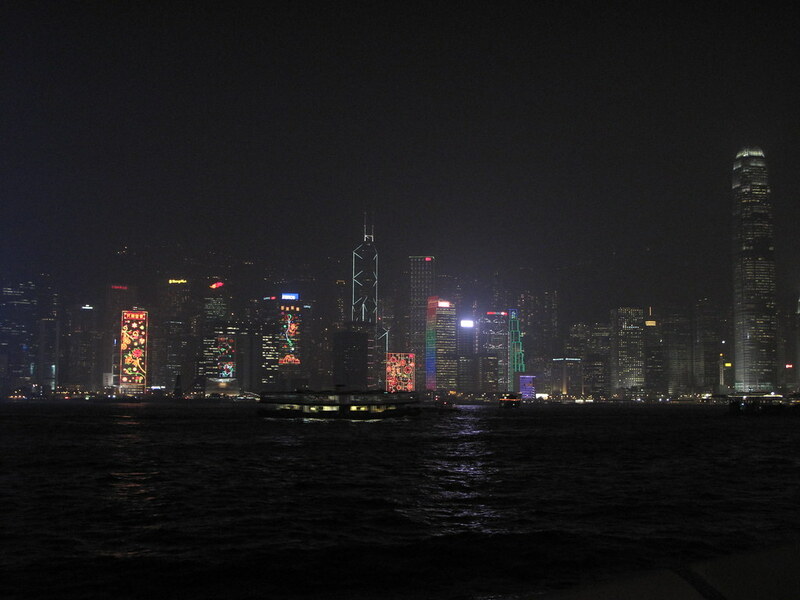 Hong Kong, a city that truly never sleeps…pretty sure you could see it from space if you needed to. I knew that Hong Kong was a former British colony well before I ever had the opportunity to visit, but I guess I never realized just how British it would still be nearly two decades after the colony was handed back to the People’s Republic. I also had no idea at the time that Anglican churches and their histories would become very interesting to me – I certainly did not foresee my return to church, nor my return to church happening in a member of the Anglican Communion. 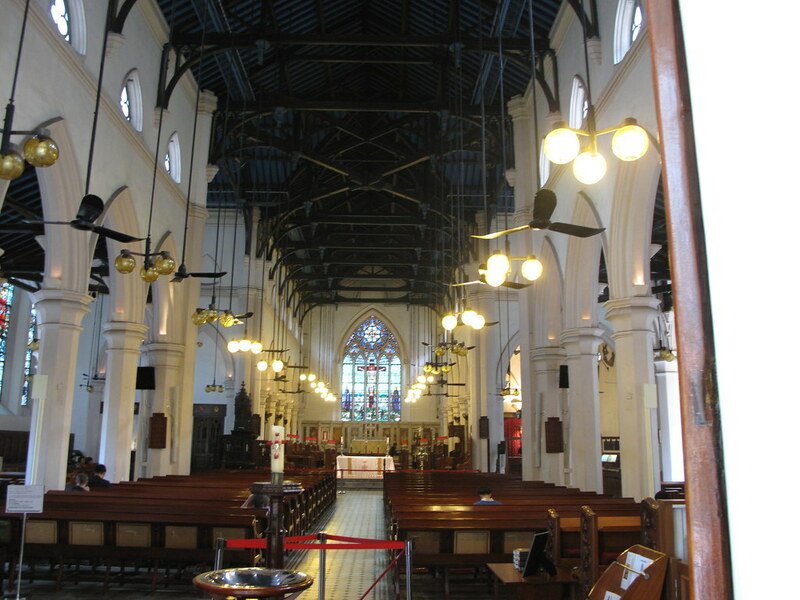 So today, looking through my old photos for a beautiful old church to write about, I came across the photos of this beautiful old church in Hong Kong, only to to burst with joy in my heart when I realize it’s the Anglican Cathedral in Hong Kong, the seat of the diocese of the Anglican Church in one of the world’s most vibrant cities. 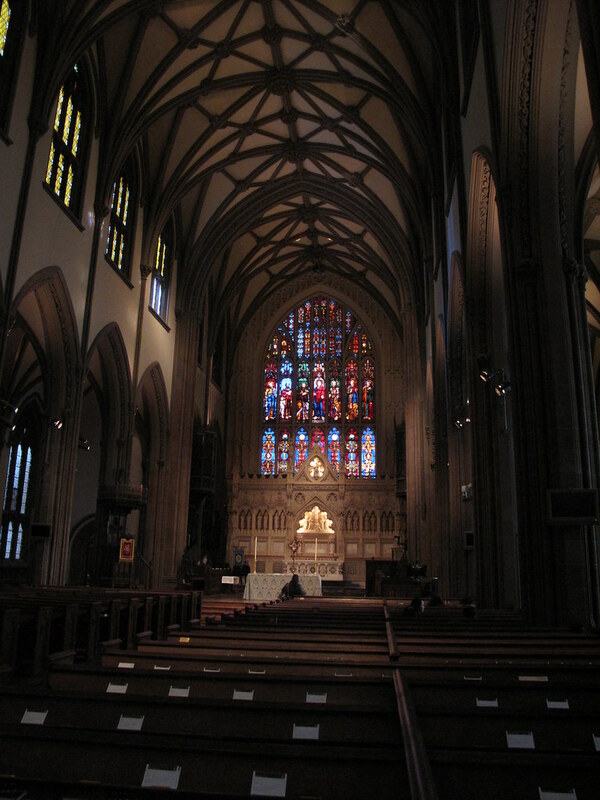 The church I’m referring to here is the beautiful, understated, Cathedral of St. John the Evangelist. 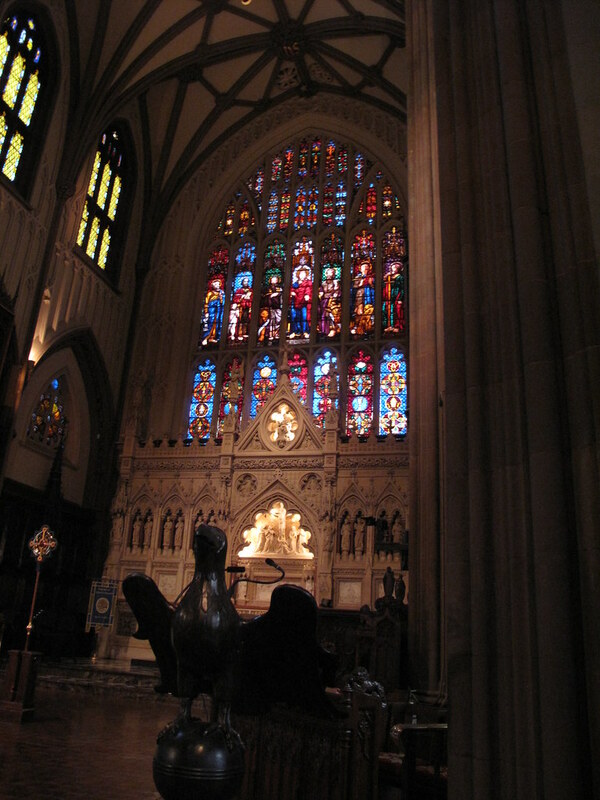 The Cathedral of St. John the Evangelist is, like the Cathedral of St. John the Divine in New York City, a haven of calm in a frenetic, bustling city. Given all of Hong Kong’s glitter and glamour, a quiet, calm spot is a bit of an oasis. I guess it always seemed that way, as the were conducting mass in the church even as the Japanese were shelling the island during the second world war. 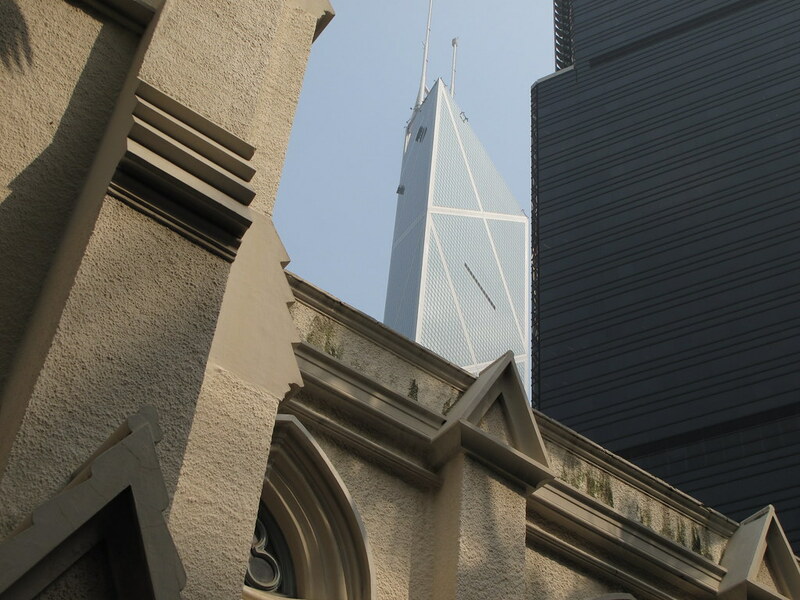 It’s also a great contrast between 19th century British Empire and ultramodern Hong Kong/Chinese architecture. The contrast is stark. From any angle of St. John’s, a skyscraper looms in the background. The sound of taxis and the lift to the summit of Victoria Peak create a din in the background. 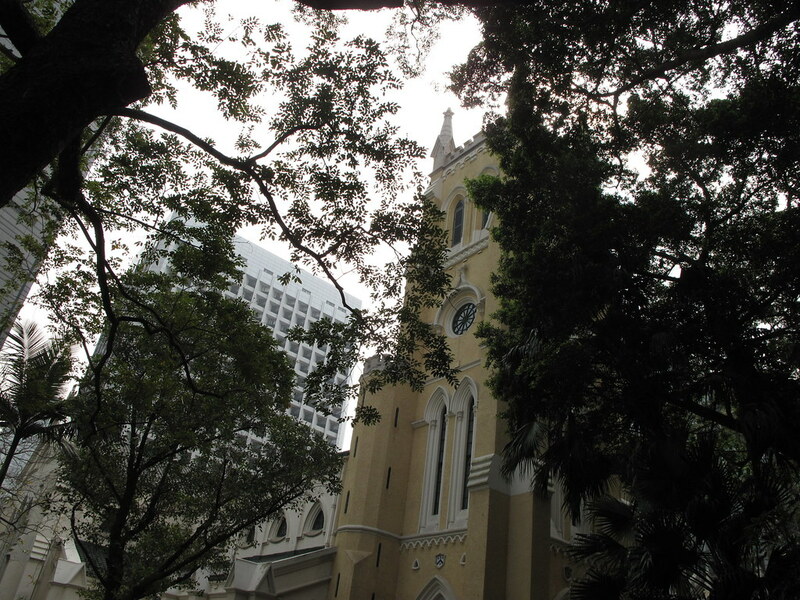 The tropical environs clash with the British decorative-Gothic architecture of 1849. What a cool old church, in a cool old/new city.